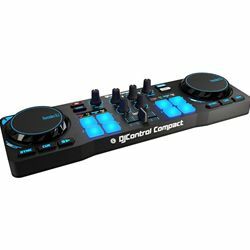 The ultra-mobile DJControl Compact controller puts the essentials of mixing right at your fingertips. Compact, complete and charismatic, it’s the must-have “on the go” mixing companion. Take it with you wherever you go to get started in the world of mixing, hone your skills, prepare your mixes and throw great parties anytime with your friends.